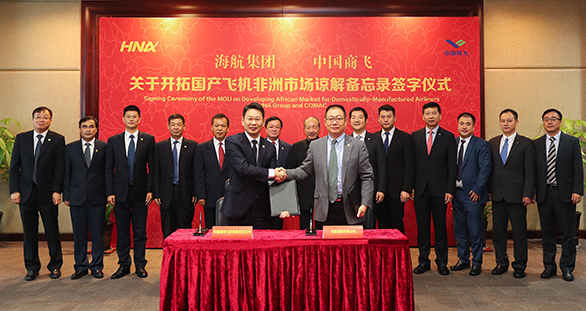 COMAC signs MOU with HNA Group__Commercial Aircraft Corporation of China, Ltd.
Mr. He Dongfeng, Secretary of the Party Committee and Chairman of Commercial Aircraft Corporation of China, Ltd. (COMAC), and Mr. Zhao Yuerang, President of COMAC, met with Mr. Chen Feng, Chairman of HNA Group, at HNA Building in Haikou on September 14th, 2018. Both sides developed in-depth exchanges and signed a Memorandum of Understand (MOU) on Developing African Market for Domestically-Manufactured Airliners, planning to rely on "the Belt and Road Initiative" to promote the large-scale and market-oriented operation of China-made aircraft in the African market. Mr. Zhang Ling, Vice Chairman & President of HNA Group, Mr. Bao Qifa, Director of HNA Group, Vice Chairman of HNA Tourism Group and Chairman of Hainan Airlines, and Mr. Cheng Fubo, Vice President of COMAC, attended the meeting. According to the MOU, HNA Group will take the advantage of the resource of global aviation operation and airline network to further develop the regional aviation market in China. HNA Group and COMAC will actively participate in the construction of regional aviation network in Africa, explore cooperation in aircraft maintenance, material support, personnel training, aircraft leasing and other areas to support the sale of China-made civil aircraft. Mr. He Dongfeng expressed gratitude to HNA Group for its firm participation in the exploration towards industrialization and internationalization of ARJ21 aircraft. He pointed out that the rapidly developing air transport industry in China is a significant advantage and powerful force in the development of China's commercial aircraft industry. COMAC would thoroughly implement the spirits of the major instructions made by General Secretary Xi Jinping on trunk liner career, and work together with domestic airlines such as HNA to make full use of "the Belt and Road Initiative", innovatively build a dream community of commercial aircraft and civil air transport industry, jointly explore the way for the marketization, industrialization and internationalization of Chinese commercial aircraft, and jointly build a competitive Chinese aviation brand. Mr. Chen Feng expressed that HNA Group, as a world-class aviation enterprise of the Chinese nation, would always have a strong sense of home and country and bear responsibility for the country. HNA Group would work together with COMAC to actively respond to "the Belt and Road Initiative" of China, seize the historic opportunity of developing China-Africa cooperation, jointly explore the market space, and actively serve the national aviation development strategy; use its own resources to help China-made ARJ21 aircraft enter African market, and open the door of international market for the high technology and value-added industries in China's aerospace field through the historic opportunity of "the Belt and Road Initiative"; and work together to promote the market-oriented operation of China-made aircraft, and boost in building China into a leader in aviation through practical actions.